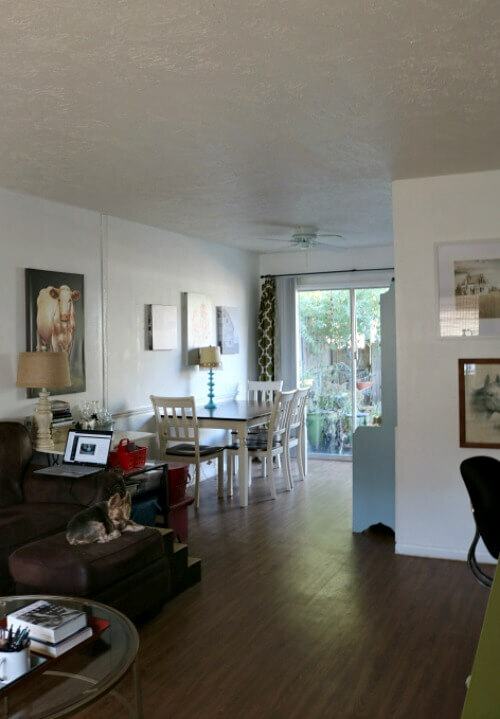 Several of you asked me yesterday to show the exact layout of my apartment. So this morning I walked from room to room. 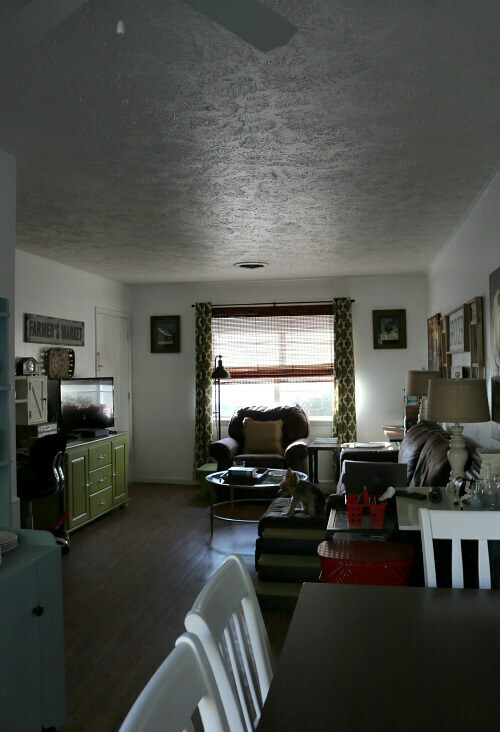 I took photos from various angles to show you how one room flows into another. This is the view from my front door. It opens into the living room and extends to the dining room and the patio beyond that. You know where my little desk is in the living room, on the same wall where my front door is. If you stand next to the desk and turn to the right, this is my small hallway. The doorway to the left goes into my kitchen. Just after the doorway is the closet where my water heater and AC/heat unit is located. The door to the right goes into my bathroom. Then there is the bedroom at the end. Standing just inside my bedroom, if you turn around and face the other direction, this is the bathroom, now on the left. And if you stand in the bedroom doorway and look straight ahead you see the living room. 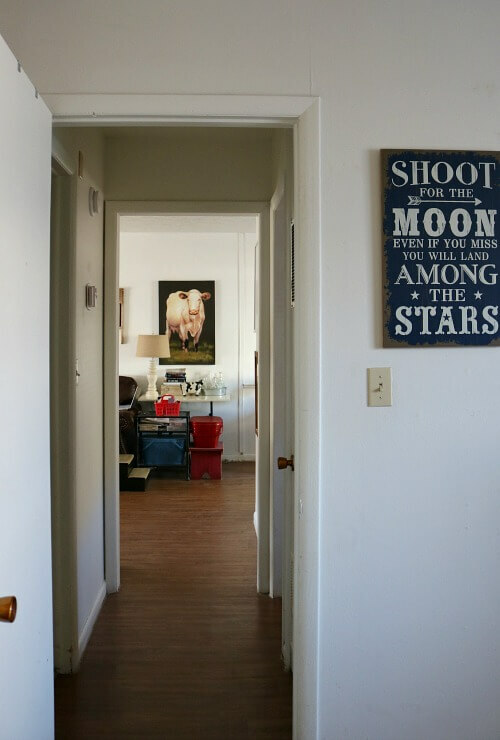 Once again I’m showing you the short wall with the farm themed painting/drawing so you can see through the doorway into the kitchen. This is just an L-shaped wall that borders both the kitchen, dining room and living room. 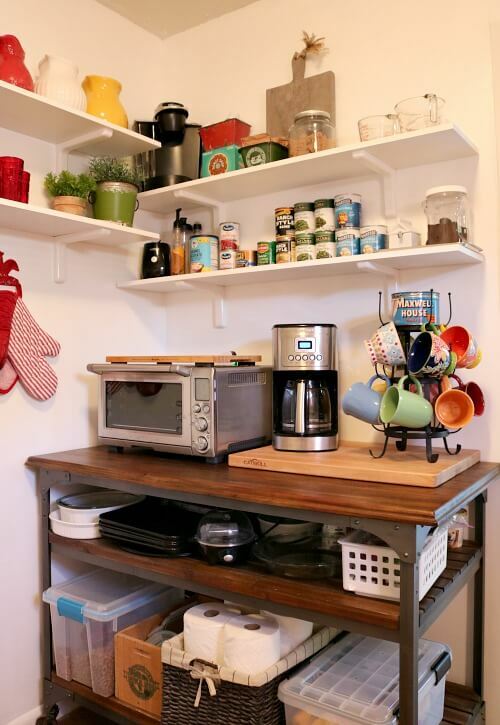 On the other side of this wall just inside the kitchen is my kitchen cart and shelves on the wall. 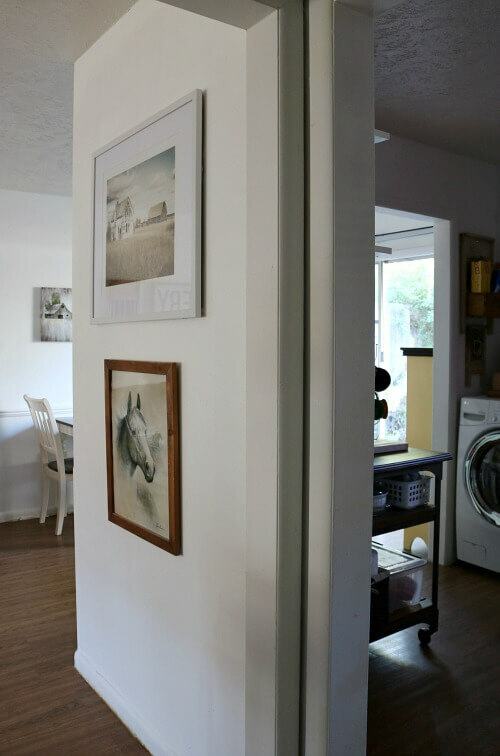 If I stand next to the washing machine in my kitchen, straight ahead is the doorway leading into my dining room. If I walk into the dining room and turn completely around just outside the doorway, there is once again the view of my kitchen. And this is the other side looking in from the doorway, where my cabinets and sink and then the washer is located. 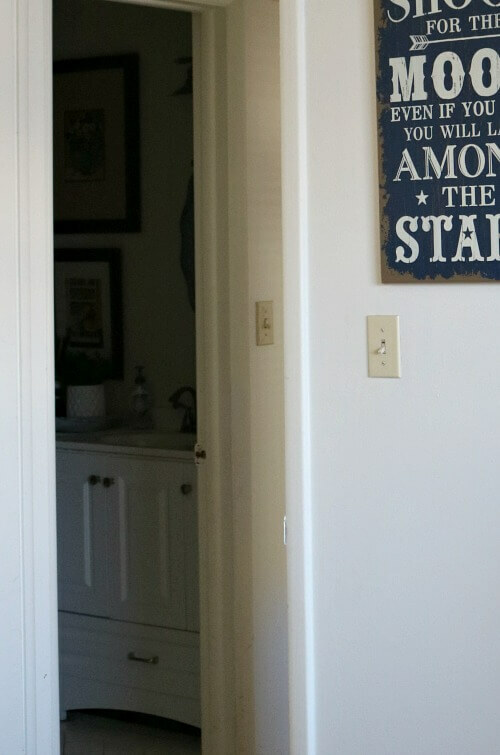 Standing in the dining area just outside the kitchen, I turn to the right with my camera. Now you can see from the dining room into the living room, which is really just one long room. 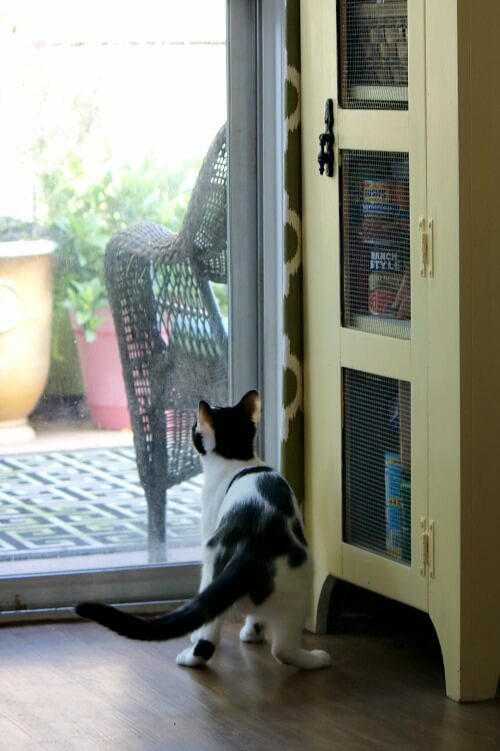 And if I turn around in the opposite direction you see the little yellow cupboard and the patio doors. Ivy is showing you. I hope this helps you get a better idea of how my apartment is laid out. I am going to put a link to this post on My Apartment page so it is more readily available. If you have any questions about what is where, leave them in the comments or email me. Happy Thanksgiving from the three of us! It is much bigger than I had imagined. You have made it into a lovely, warm and inviting home. Cozy describes it well. Happy Thanksgiving, Brenda. I just love your apartment! You are so creative. I used to love it when you shared other small apartments, but understand that you can’t. Your apartment is so bright and cheerful, and so well organized. Happy Thanksgiving to you and your fur babies. Your home is fabulous! Very warm, cozy and inviting. Thank you so much for sharing. Such a cute apartment that you have made into a home!! May you always have something to be thankful for…. you’ve done an amazing job on your space.. your should be very proud. What a cute apartment AND layout! 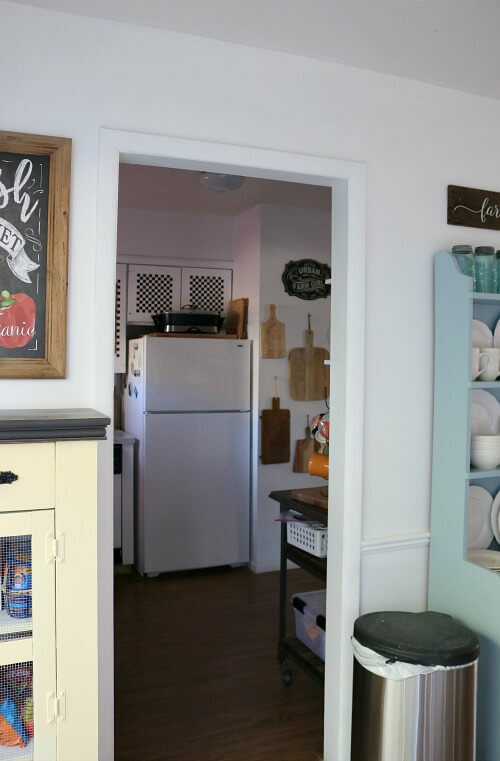 I love the two entries into the kitchen that makes it more homey! LOVE it! 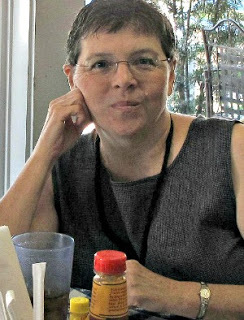 Brenda, what fun! Thank you so much for the photos explaining the layout! I get how everything relates to the rest of your apartment now. It does look bigger than I was imagining like another reader commented. I wish you could come over and help me with my small house, you did a great job making your space cozy and charming. I hope you and the babies have a nice Thanksgiving today! Do cozy for sure! I was wondering how you were managing taking pictures without Charlie and Ivy showing up, and then the pics of them came up! Love your home! Blessings. Yes, you have a wonderful apartment, well laid out, and your patio is to be envied. Happy Thanksgiving to you and the pets. I love your creative use of color. You have just the right touch and don’t overdo it. 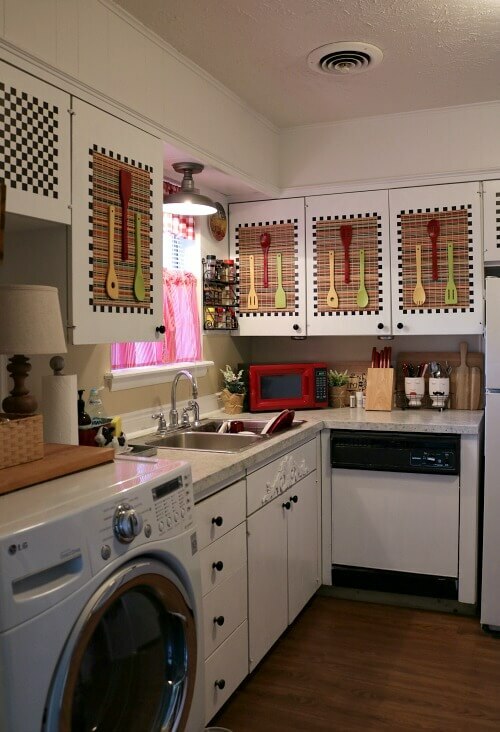 I covet your wall quilts and I think your kitchen cupboard doors have been copied and posted on several sites. They are delightful. My niece has two questions. Now, that your apartment has been well insulated, will you post if you notice a change in the temperature and your heating bills? She also wants to know if the new insulation will solve the mouse problem in the kitchen cupboards. She is getting an apartment next term and is very inspired by your posts. She is constantly searching for the perfect quilt for her new bedroom wall. Happy Thanksgiving and thank you for being an inspiration for both the young (my niece) and the old (me)! Happy Thanksgiving Brenda, Ivy Lou and Charlie! I hope you are having a great one. I love your tour, this is a beautiful and charming space and perfect for the three of you! Brenda, you have truly done an amazing job decorating your home. It is so cozy. Thanks for sharing. Happy Thanksgiving. Brenda, you have truly done an amazing job decorating your home. It is so very cozy. The title of your blog is totally accurate. Happy Thanksgiving. Wow! Lovely apartment Brenda. You are so neat and organized! Amazing. I should be like this! Saw Charlie in one photo. So cute & tiny your boy is. Happy Thanksgiving Brenda. Hope your daughter brings over holiday dinner later! not many blogs live up to their names but ‘cozy little house’ does. I’m glad Charlie Ross and Ivy Lou could be in some of the pictures. it’s their home too and it’s a wonderful little family home you have! How fun! I love it! Happy Thanksgiving to all three of you! I love it! And the kitchen is so adorable!! You certainly have made this place your own. Just goes to show, you don’t need a huge place to make it nice. It looks very cozy and inviting. Happy Thanksgiving to you, Charlie and Miss Ivy Lou. Your place looks larger than you describe and so very inviting. Oh and your fenced patio! I have never seen such a generous area allotted to a single unit. I love your apartment … your decor is wonderful! No wonder you enjoy staying at home with your fur babies! What a great job you have done. I am so impressed! Happy Thanksgiving to all of you. What a delightful Thanksgiving visit to your lovely home. Thank you. I love your paintings you’ve selected. The quilts are amazing and your sense of color and use of it is great. You certainly have an artistic eye for decorating. Happy Thanksgiving to Ivy Lou, Charlie and you. Hope you have a relaxing and peaceful day. 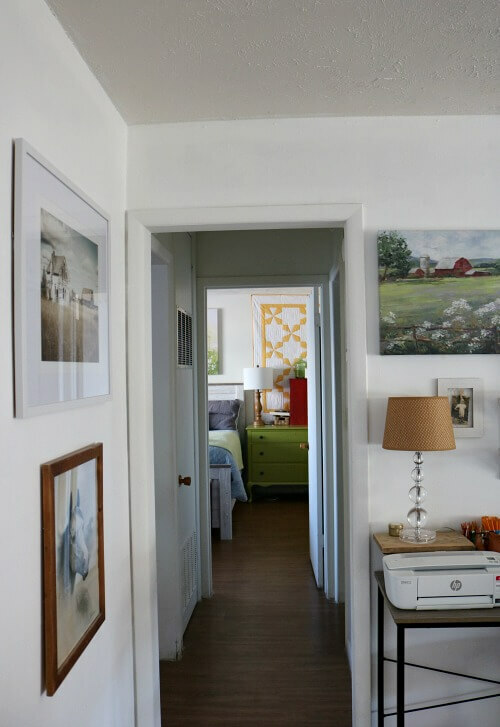 I love your apartment, the way you decorate, and your blog! Some of my happiest memories are when I lived in an apartment in my 30’s. The apartments were made solid back in the 1970’s. Like you, I enjoyed decorating and redecorating my space. 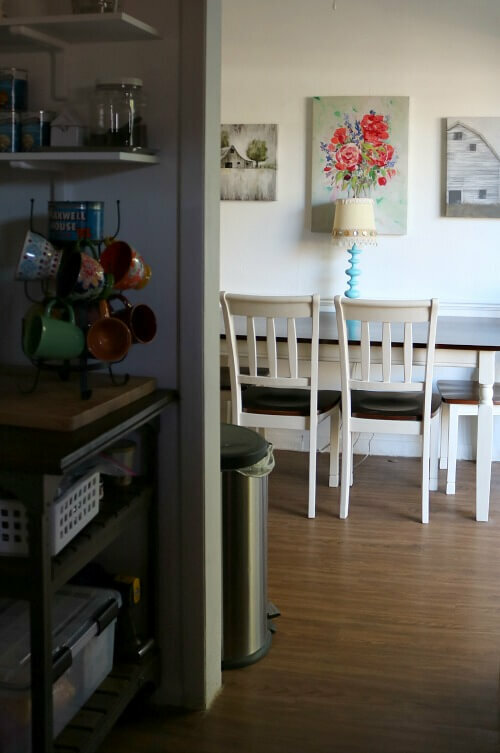 Now I live in a small house, so I need inspiration in making best use of space and decorating a small home, which is one reason I love your blog. But I must ask: where is the cat tree? Did I miss it? The cat tree was on the yellow table under the bedroom window where Ivy eats. But she was about to knock it over and I was fearful her food would go everywhere and Charlie would eat it, which could make him sick. So I moved it over on a little table next to green sideboard with the quilt tacked over it on the other side of my bed. I guess I didn’t get that far in photographing yesterday! Brenda, I agree with everyone comments above. It is nice to see the layout. It is cozy and inviting. I love what you have done to the bathroom. 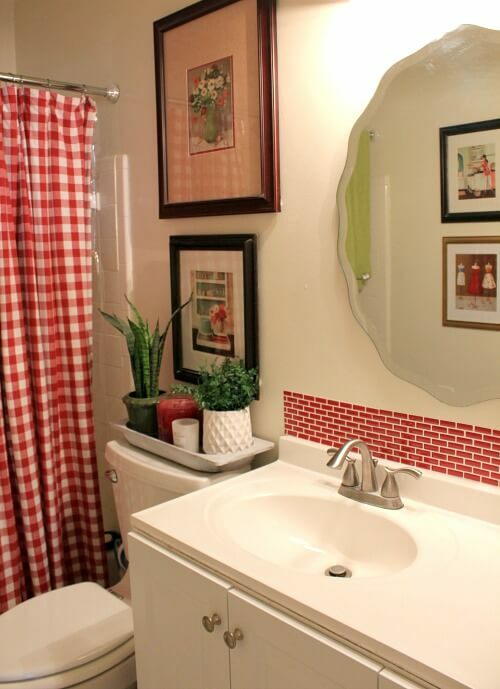 Can you tell me what you used above your bathroom sink in the bathroom – the small red and white check? I love the two looks. Hope you had a nice Thanksgiving! It is peel and stick tile. But I’m going to have to take it off because it is so humid in the bathroom and it keeps curling. I might have to go with real tile. I love the coordination of the red and white in the bathroom. It’s definitely a cozy little house Brenda! Well, that was really fun, Brenda! You have a really homey, cozy and thoughtfully decorated little “house”. The only part I’m unclear about is the location of the front door. In the photo looking into the living room from the dining room I see the large window and I think I see the door on the end of the wall on the left. Is that correct? Except for the fact that I have two more bedrooms than you have I think the size of my “living space” is about the same as your apartment. And I have a full basement, of course, with my small laundry room down there. The rest of that area is pretty much storage and junk right now. Also, I think your main rooms–kitchen, dining room and kitchen are better arranged for traffic flow than mine. My dining room space is quite a bit too small. Of course, I have more pieces of furniture in it than you do! One thing I noticed was your farm theme with the barn pictures and the cow portrait. I like all of those. I was wondering, though, where the beautiful painting of the yellow roses went. I remember that being over the dining table. Thanks for giving us the “tour” of your living spaces. And Happy Thanksgiving! I gifted the yellow rose painting to someone. Some of you warned me that it might be too “elegant” with my decor when I ordered it. Seems you were right. It just didn’t fit in with farmhouse decor, which is what I have a lot of. I just checked and you can see the front door in the next to last photo. Yup, that’s where I tho’t it was located. Thanks for confirming! Your home is larger than I imagined. How many square feet is it? I love the colors. Very neat! It is 725 square feet. Very nice layout Brenda and I love the light you get in your place. You have each room done up so cozy and nice. Actually I wish I had more light. I only have three windows aside from the patio door. I have a living room window, a bedroom window and a kitchen window over the sink. Your bathroom looks so fresh and clean. I like how you did the small red tile backsplash behind your bathroom sink. It all just looks so pretty. You have decorated your home beautifully. You have such an adorable apartment. You seem to have a place for everything and everything in its place. I have a terrible time with storage and things seem to pile up. Anyway I love your apartment and the way you have decorated..
Charlie looks so cute in your living room picture. Your home is cozy and cute. I absolutely love the bathroom. It’s a shame you have to remove the tile. It is a perfect little space. Thanks for sharing your small and cozy space. Brenda, I love your home! You have done an amazing job decorating it and making it yours! 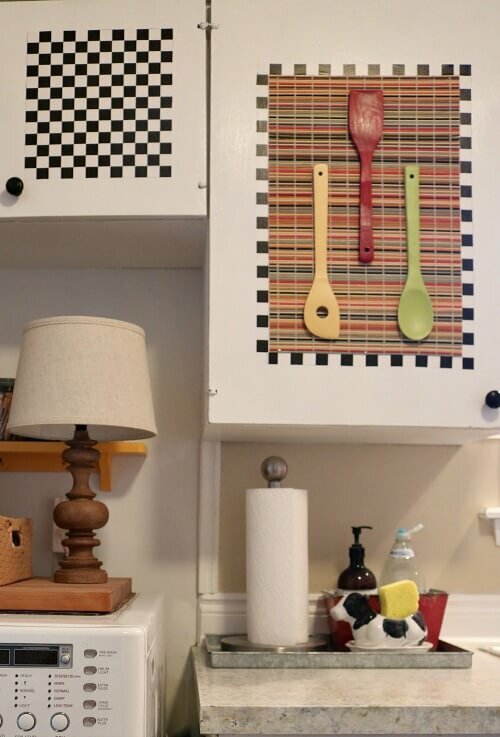 You have also been creative with your storage and with items that need to do “double duty” for you! So, so pretty!! Hope you had a wonderful Thanksgiving! Love and hugs! It’s really cute. Every room is an adventure. My kind of home!